Ever since I was a little(r) girl I dreamed of being a missionary (I aspired to become like Mother Teresa haha). However the lesson that God has been impressing on my heart this season is the true cost of discipleship; in particular He's been challenging me with the passages Isaiah 58 and Philippians 2 - am I really willing to be SPENT for Jesus; to POUR OUT my life for the sake of HIS name and the Gospel, just as He poured out His life for me?! 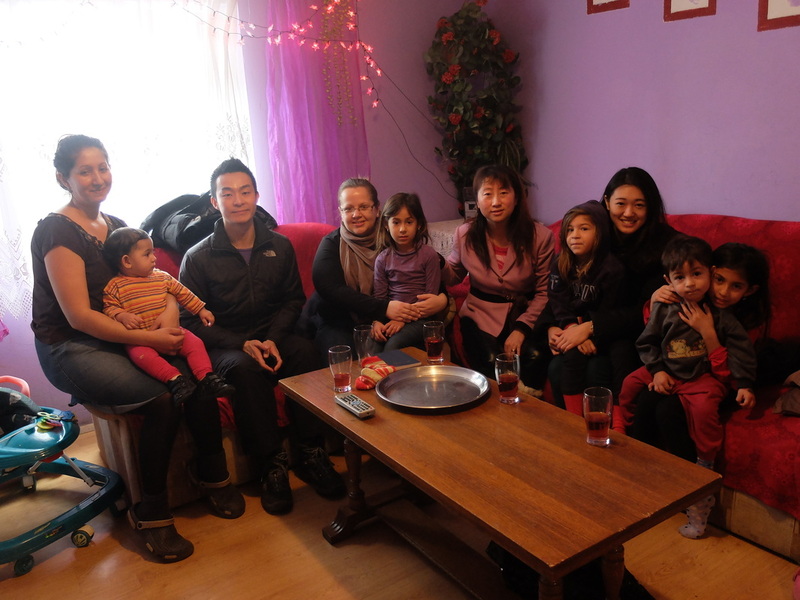 The meaning of Christmas became more real to me as we entered the homes of the Roma families we were visiting. Most families used wood stoves so the homes were often quite smoky. As a result many of the children in the homes we visited suffered from respiratory problems (pneumonia, bronchitis). I wondered how the life expectancy compares to that of the general population. This reminded me how Jesus deserted all His former glory to enter our filthy and dark world of sin. Unlike the Roma people He was not warmly welcomed into our midst; in fact although the world was made through Him, we "did not recognise Him". I have been inspired by the example of Andy and Lim and their co-workers in their ministry to the Roma. I can see that it is quite lonely for them at times, especially in a place where the language is foreign. Then there is the cost to physical health. 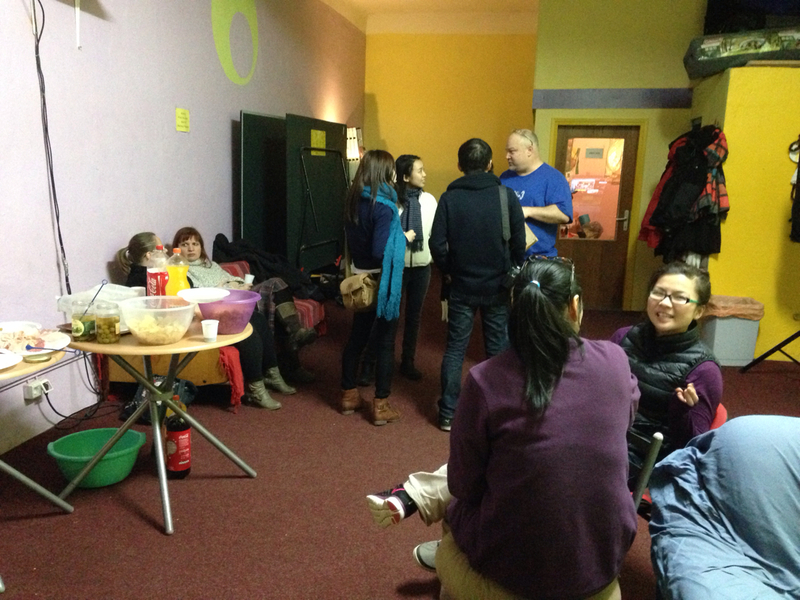 During the trip any of our team fell ill, including Andy, Lim and co-workers Zeljka and Sergej; but I was humbled and encouraged at the selfless pouring out of love to the village and each other through the power of the Spirit in spite of sickness. Yet for all these "trials" I can see how they pale in comparison to the overflowing joy that comes from seeing fruit - the trust that has been built up through this long term relationship of Andy and Lim with the little Roma village is heartening. A strong Jehovah's Witness influence grips the village, but even in this darkness I saw rays of hope. On the penultimate day of our short visit to Croatia our team visited a family. Like many other families they had been visited by Jehovah's Witnesses; however they shared that they did not like the JWs as they had tried to impose strict rules and extort money from them. 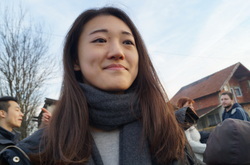 Andy and Lim however had won the favour of people's hearts in the village (in stark contrast to before), through the practical love shown through action e.g. holding UNA clubs for the children; visiting and praying for families of the sick; helping to raise money for roof repairs for a Roma family. 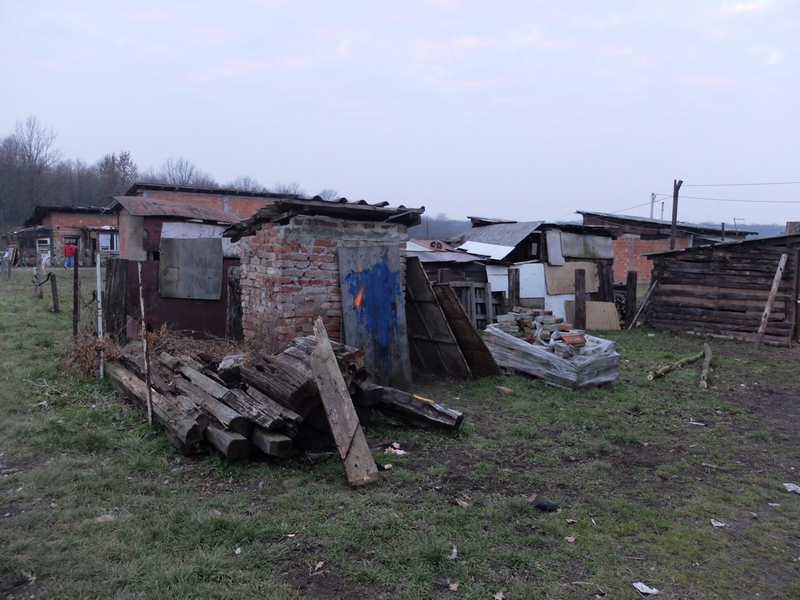 THE SHORT-TERM MISSION MEMBERS have been back for two weeks, but surely part of their hearts remain attached to the Roma villagers in Slavonski Brod, where God's great work never ceases. During the trip everyone observed and reflected upon this ministry in their own way. Collectively, we came up with several issues that might concern outsiders. Here are some of the main issues about this missionary. Hopefully by reading it brothers and sisters will be able to offer informed support and prayer to Andy and Lim in near future. There are 10 computers and 3 Play Stations. iClub is an Internet bar near Slavonski Brod's town centre, where a bunch of teenagers come upon paying a small amount of membership fee. 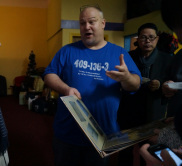 Andy started it few years ago, instead of establishing a church immediately for the ministry, in purpose of developing good relationship with the Roma and local teens. Surviving profitless, the iClub lives partly on normal income and the rest on church offering. Resources are not adequate; manpower is not enough either. Nevertheless, Andy and Lim are called by God to relocate iClub to another venue closer to the Roma village, which implies more resources will be needed. This is a crucial transition towards building a church for the Roma village. After gaining a certain level of trust from the Roma kids through UNA festival and other UNA activities, Andy and Lim are now taking a further step to mingle with their parents, their families. 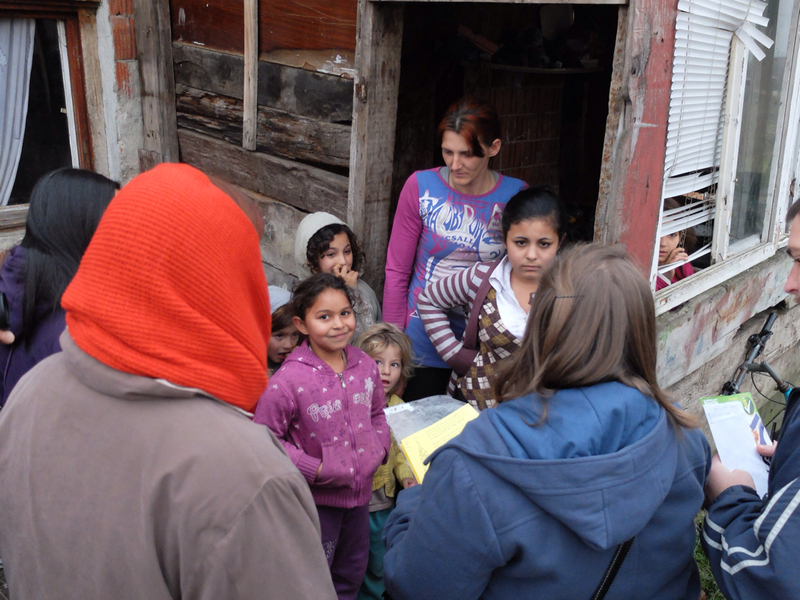 Praise to the Lord, over thirty families expressed interest in this bible study when we went to visit their homes. So the couple, along with the translators, will go into each house to conduct a five-section bible study in the upcoming days. Regardless how many families would continue to commit, the immense workload born from this project is undoubtedly the most urgent challenge ahead. 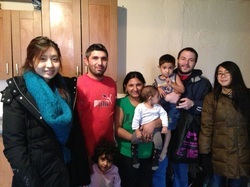 Team members visiting families in the village. Almost every family in the village knows and has had contact with people from Jehovah's Witnesses, and their level of acceptance vary. Some families might confuse Andy and Lim's bible study with the JW's. The couple strives to clarify their oppositions to JW before the villagers. Despite already having a basic understanding of each other, most communications between the Roma people and the missionary team relied strongly on translators. From teaching kids origami crafts to home visiting to bible studying, there was not a time a committed translator was unnecessary. The four volunteering translators - Željka, Sergej, ‎Palma and Safet - have all fully devoted themselves to this ministry. They spoke to everyone and gave us guidance every minute, and we could imagine that exhausted feeling. Two of them are not based in Slavonski Brod. Therefore, provision of more translators and an increase of language ability would be a huge help to the ministry. A big goal of this ministry is to have a church built for the Roma villagers. It may happen very soon or quite later, depending on the progress of family bible studies. Venues, manpower and resources are all concerns. And after the church is built, daunting follow-up work will start rolling up. Much wisdom and patience is needed and, by that time, a new vision from God may needed to be sought as well. Nino, 7 year-old, is an active kid of UNA Club. You might identify it as uncivilized, but whatever it is, Roma people has life attitudes we find hard to empathize. They don't have time concept. They don't work. They don't treasure education. It is difficult to tell which would result better -- as missionaries whether we should try to correct their attitude or learn to cope with it. As for religion, Roma in general perceives religion as a kind of historical or even ethnic inheritance. Many call themselves Christians without knowing the true meaning of believing in God and to live out a Christ-like life. To change their mind-sets fundamentally – to make them realize faith is not a cultural but a spiritual matter, understanding Jesus is not a religion but a relationship, would be one of the ultimate goals of this special ministry. Bowie, 22, finds her calling in missionary. It is easy to just come and go and forget about what we wanted to get out of this mission trip. During the last few days of the trip, team members shared their concerns about their life afterwards, where the real impact of the trip would manifest. Some consider coming back and to continue to commit to this ministry for long term. May God continue to inspire them through the way He favours. This is the first time in Andy and Lim's ministry that we can visit the families and parents in the Roma village (we have been doing UNA activities with the kids for 3 years). We were put into three groups to go into houses and tell them about the Christmas story and the gospel; and as Andy summed up tonight, we have visited 60 houses out of like 175 houses in the village; and around 25 have shown interest in having bible study sessions!! 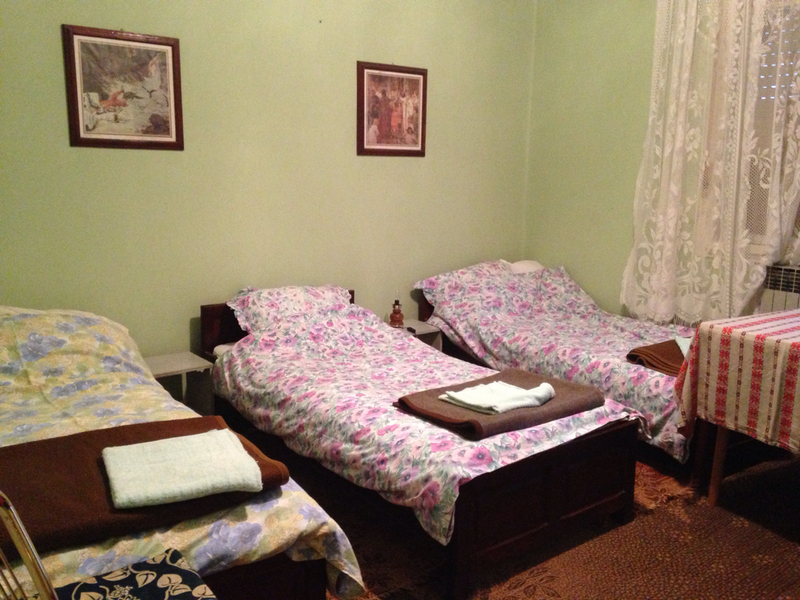 The families are generally very friendly and welcoming, and many of them are receptive. As one of our translators and co-workers Palma said, these 10 days is like a big breakthrough! We have started to truly see the needs of the Roma kids as well as the environment they live in after visiting their village. We went there to invite kids to our Christmas parties tomorrow. The parents are much more opened and have mostly consented their 6-12 year old children to come to the party!! While our translators were doing the invitations, others took the "distraction jobs" which was to distract and play with the kids so they would not be "crowding" the doors of the houses. Instead of bringing in love and hope, I really want to express how blessed I am to actually be welcomed and embraced and loved by the kids. They may have violent behaviours among themselves, but their needs are just like ours. They have so much love to give away but their expressions might not have attracted recipients back home... Anyway, we can share more, personally, when we are back. Haha. Bok everyone! I am writing this blog entry at the I-club in Slavonski brod, Croatia! It is very exciting to see bros and siss either talking to Andy and Lim or playing around with few Roma kids. We arrived on schedule this afternoon at Zagreb. However there was actually a slight accident in the morning when Tim&apos;s car&apos;s tire got burned when he was around 10 minute drive away from Heathrow... In short, he missed the flight and is joining us tomorrow. And the van we booked in Croatia was booked under Tim&apos;s name... Nevertheless, our negotiators Wien, Charis and Elisabeth got the van for us! So we managed to have a two-hour sleep (except for the drivers) to cheer up our body. 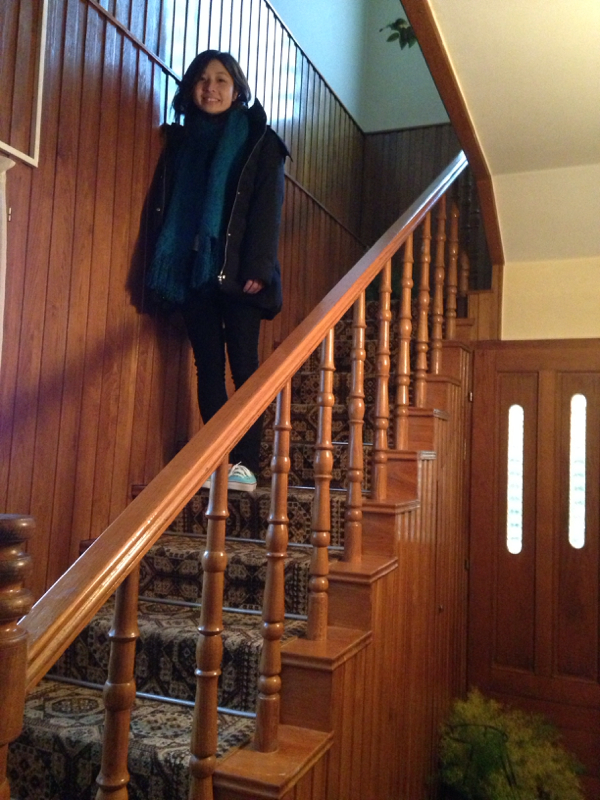 The home we stay in is indeed very cosy. We spent some time enjoying our lunch which was a Gypsy Potstew, and had some fellowship time and rest... As there is not much of a schedule for today, some of us went to shop for groceries, and we came out altogether tonight to join the fun and joy of Croatian and Roma people on this new year eve! Anyway, that&apos;s all for my report of the day. Haha! And some photos for now! And here you are, some information on who Andy and Lim are! Andy grew up in a US military family with his parents, one brother, and one sister. He became a Christian as a PhD student in Pennsylvania, attending the Alliance Christian Fellowship. Soon after he developed a passion for missions and participated in two short-term mission trips to Mexico. He then attended Columbia International University, pursuing a Bible Certificate. He worked in the computer field in Virginia for several years, attending Faith Bible Church of Sterling, Virginia and serving in the international ministries program. In 2001 he visited Croatia on a survey mission trip and in 2004 was sent by Faith Bible Church to Slavonski Brod, Croatia as a long-term missionary with the Pioneers mission agency. Since 2004 he has been serving on the Pioneers church planting team at Slavonski Brod, Croatia. Lim grew up in Hong Kong with her parents and one older brother. She became a Christian as a teenager at Evangelical Free Church of China – Grace Church. There she grew in her spiritual walk with the Lord and served on the Youth Fellowship Committee. She went to the UK to study nursing and midwifery and worked there for nearly 20 years. While in the UK she attended and served on the Missions Concern Team at the Chinese Church in London. Later, she served with missionaries from the Chinese Overseas Christian Mission in planting the Essex Chinese Christian Church. Her passion for missions started during her early years in the UK. She has participated in short-term mission trips to UK, Spain, Sudan, and Indonesia. In April, 2007 Andy and Lim were married in Epping, England. As a couple they were accepted by Pioneers in 2007 and sent to Croatia by Faith Bible Church (US) and Essex Chinese Christian Church (UK). They then moved to Split, Croatia where they studied the Croatian language and attended Emmanuel Baptist Church. In October 2008 they rejoined their missionary team in Slavonski Brod, a city of 60,000 in eastern Croatia, where they serve with their team at the Baptist Church of Slavonski Brod. 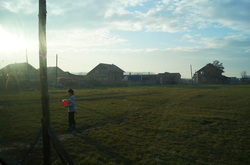 Andy and Lim have a burden for the spiritual needs of the Roma (Gypsy) people in the Balkans. They partner with the Roma Bible Union in ministering to Roma children in Slavonski Brod by operating UNA Children’s Bible Clubs. These clubs present the Bible over four years as well as literacy training. Currently, there are 4 clubs with a total of 70 children. Each summer a 3-day UNA Festival attracts virtually all of the 200 children (age 4 -12) in the village and ends with an open-air evangelistic outreach. The next step is to plant a new church in this very open village! 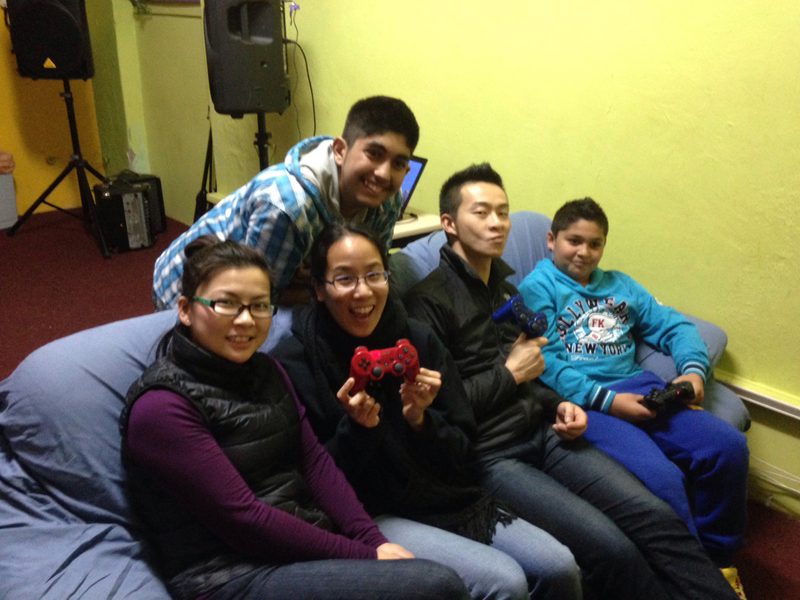 Additionally, Andy and Lim operate a non-profit Christian organization named “iClub Connect.” Currently with over 600 members, iClub Connect is a vital point of contact with the youth of Slavonski Brod. 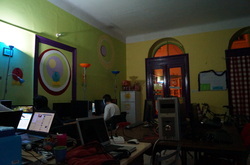 The iClub is financially supported through its internet Café business. It also hosts computer classes and training and Christian outreaches and events. "My name is Željka and I was born and raised in Slavonski Brod, Croatia. I came from a traditional Catholic Croatian family with my parents and two younger brothers. My mother came to faith in Christ when I was 17 years old. Soon, I started becoming interested in faith and God. Eventually, in 2006, I accepted Christ and started to worship together with my mother in our local Baptist church. In 2007 I felt God’s calling to children’s ministry. With my church’s support, I studied Theology and Christian pedagogy at Osijek Evangelical Theology Seminary. 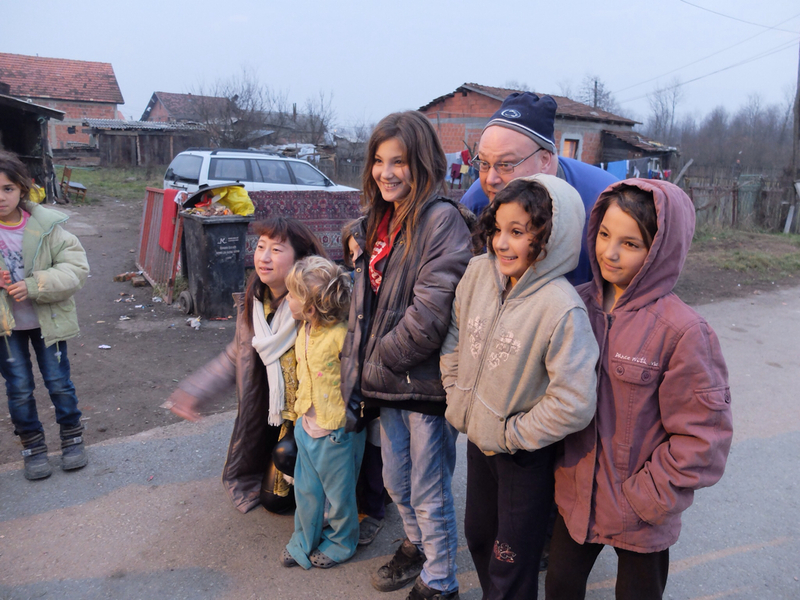 In 2011 I began working in a new Roma children’s ministry with a missionary couple in Slavonski Brod. 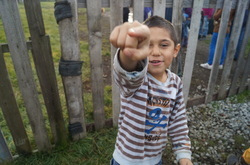 Though this Roma children’s ministry I am now employed part-time by the Roma Bible Union (RBU). 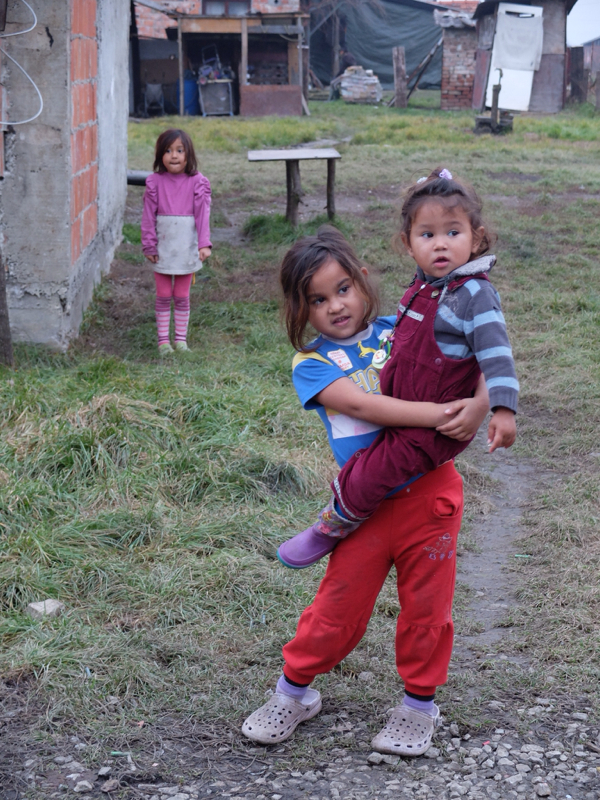 I am happy that I can serve the Lord by ministering to the Roma children." We welcome you, our bro and sis, to pray-read with us the verse for the day! 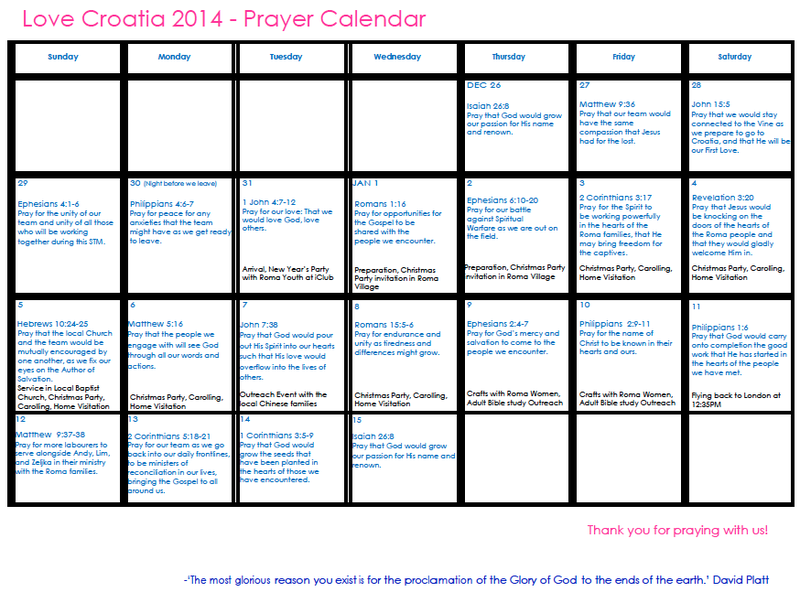 A brief description of what we will be doing on the day in Croatia is in black, so if you can, please pray for us accordingly too! The team is now practising for the CHRISTMAS DRAMA for the Roma kids!! 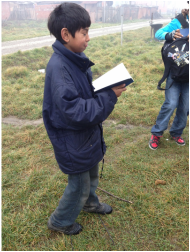 We hope to stick to the Bible, and act out the story with one of our Croatian helper being the narrator. 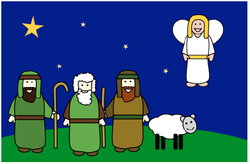 Now have a read of our storyline and remind yourself of the Christmas Story? When they reached Bethlehem they had problems finding somewhere to stay. So many people had come to register their names in the census, that every house was full and every bed was taken in all of the Inns. The only shelter that they could was a stable or cave with the animals. In this poor place Mary gave birth to Jesus, the Son of God. In those days it was the custom to wrap newborn babies tightly in a long cloth called 'swaddling clothes'. Jesus' bed was the manger that the animals ate their hay from. In the hills and fields outside Bethlehem, shepherds looked after their sheep through the long night. As the new day began, suddenly an angel appeared before them and the glory of God shone around them. 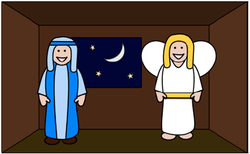 The shepherds were very, very scared, but the angel said, 'Don't be afraid. I have good news for you and everyone. Today in Bethlehem a Saviour has been born for you. You will find the baby lying in a manger.'. When Jesus was born, a brand new bright star appeared in sky. Some Wise Men in faraway countries saw the star and guessed what it meant. They were very clever men that studied the stars and had read in very old writings that a new star would appear when a great king was born. They set out to find the new king and bring him gifts. The Wise Men followed the star towards the country of Judea and when they got to the capital called Jerusalem they began to ask people: 'Where is the child who is born to be king of the Jews?' Herod, the king of Judea, heard this and it made him very angry to think that someone might be going to take his place as king. Herod sent for the Wise Men to come to him. He told them to go on following the star until they had found the baby king. He said: 'When you have found him, let me know where he is, so that I can go and worship him.'. But Herod did not tell them that he really had an evil plan in mind to kill the new king. 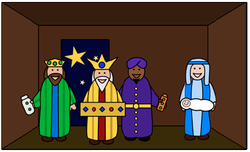 The Wise Men followed the star towards Bethlehem (where it said that the king would be born in the old writings). It seemed to stop and shine directly down upon the place where Jesus was. The Wise Men entered the house where they now lived and found Jesus with Mary, they bowed down and worshipped him. The Wise Men spread the the gifts they had brought before Jesus. The gifts were gold, frankincense and myrrh. The Wise Men were warned in a dream, by God, not to go back to Herod. So they returned home to their countries in the East by a different way.